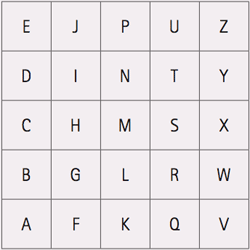 Every 10×10km square of the Ordnance Survey national grid can be divided into 25 tetrads, each allotted a letter of the alphabet from A to Z, omitting O, as in the square below. The full reference for a tetrad consists of the two-letter Ordnance Survey label for the 100×100km square—which is SJ for all of Cheshire and Wirral apart from the two easternmost tetrads which lie in SK—followed by the two-digit designation from the easting and northing 10 km gridlines and finally the tetrad letter. For instance, Thornton Manor Lake, Wirral, is in tetrad SJ28V, Reaseheath College is in SJ65M and Pott Shrigley in SJ97P. This key is also provided on the breeding and wintering maps for each species.